While the largest economies in the world, bar the US, come to some sort of agreement on global warming, should we as consumers take some responsibility for what’s happening? The idea that Ireland alone is responsible for increases in emissions, because of our cattle herd burping, is a little bit disingenuous and allows our greener-than-green parties to further their own agendas. Fossil fuels and industrial processes account for nearly two-thirds, or 65pc, of our global emissions, while methane is only a fraction of this. 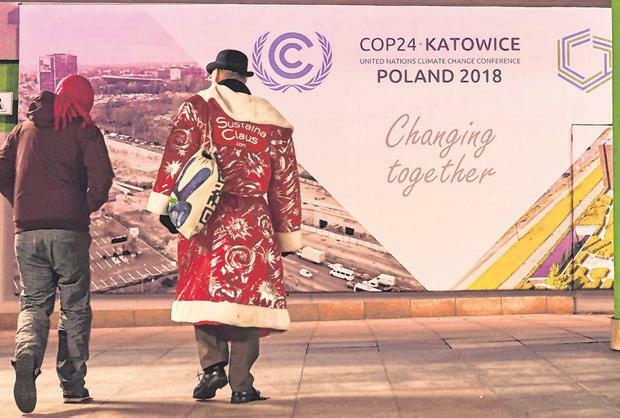 In Poland, the COP24 climate talks are taking place. Poland itself is reliant on coal to keep its economy going and more than 90,000 employees at work. It is the biggest producer in Europe. The EU’s plan to cut carbon emissions by 40pc by 2030 is ambitious, and to net zero by 2050 is aspirational, to say the least. Eurostat greenhouse gas emissions statistics show that emissions have dropped considerably, by 22pc, from 1990 to 2016. While countries within the EU are doing their bit, larger economies like the US, China and India are not governed by the same rules. We as consumers must realise that our hunger for consumer goods, whether online or at our local retail store, has contributed largely to the increase in carbon emissions. We don’t see the exploitation of children or people in Third World countries, in sweat factories, or the pollutants that spill into their rivers. We ignore the large factories in China, India or Eastern European countries, where fossil fuels are used 24/7 to keep these factories and businesses going. Our endless appetite for new brands of clothing and electronic equipment and our demand for the latest versions of both is one of the root causes of this increase in global emissions. We must make this world a better and safer place to live in for generations to come. Our endless need for consumer goods may satisfy our cravings in the short-term, but what damage to nature have we caused by this endless greed? The GAA, and indeed other sporting organisations, should study the progressive rule changes made by the International Hockey Federation over the past 20 years. It’s a surprise that someone like Dessie Farrell, who played at the highest level in both hockey and Gaelic football and was involved in the Gaelic Players Association (GPA), does not have a major input with the GAA, or perhaps he wasn’t asked. I would regard myself as a typical avid Irish sports person, but definitely not a hockey player. However, I believe the adoption of most of the hockey rule changes that have evolved over quite a short period of time, including the use of video technology, would be a major boost to the GAA and a huge embarrassment to the soccer dinosaurs. The fifth Annual Property Summit is being held in the Aviva Stadium tomorrow. Housing Minister Eoghan Murphy will speak, as will many property experts. This summit will “explore the latest developments in Ireland’s property landscape”. As this topic concerns every Irish citizen, I cannot fathom how entry to the event costs “from only €350” for a single ticket. What about those living in hotel rooms, or homeless people, or those who won’t, or can’t, shell out €350? Those people absolutely need to know about developments in the sector. A property summit should not be an event for the elite, it must be all-inclusive, and that means a free event so everyone can participate. If the venue is the cost factor, then we can have an open, public summit in Leinster House and, under the present circumstances, surely the experts here would not even consider accepting a fee for their contribution. Over the weekend, exasperated Irish citizens again took to the streets in an effort to draw attention to the Government’s pitiless attitude towards homelessness – facilitating profit-making is paramount, it seems. In Paris, simmering disgruntlement with growing social inequity is manifesting itself in dangerous street protests. Those that sit atop an unjust social pyramid never seem to learn; history shows us that allowing greed – in this case, grasping capitalism – to triumph over decency never ends well. On A recent political-discussion panel TV show, a young man said he wanted “forward-thinking political leadership”. Oh, the enthusiasm, or maybe ignorance, of the young. What most of the people want is a bit simpler – let’s start with a ‘thinking’ political leadership. There are plenty of candidates for any political position, so surely there must be a few clear-thinking individuals in waiting or already in the position, although the number that deny climate change casts doubt on this. At least the UK is honest with its ‘Official Monster Raving Loony Party’ that caters for the more diverse-thinking potential politicians. Looking at a number of countries, we see leaders that don’t seem to be the most capable of thinkers and a number of others that just follow their party line so they don’t have to think at all. There needs to be a minimum standard for those that represent us – they should sit a ‘thinking’ test. There would also need to be tests on character, integrity, humanity, work ethic, honesty and much more. These tests would weed out most potential candidates.